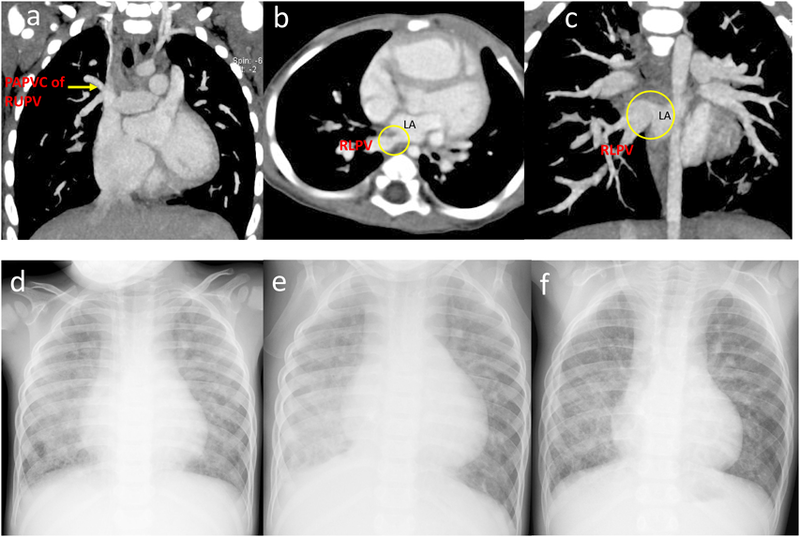 Congenital pulmonary vein stenosis (CPVS), first reported by Reye et al. in 1951,1) is a congenital stenotic disease of the ostia of the pulmonary veins in the left atrium. This cardiac anomaly is extremely rare, accounting for 0.03% of cases of congenital heart disease.2) It has been reported that 30–80% of patients with CPVS have other abnormalities such as a total or partial anomalous pulmonary venous connection or cor triatriatum.2, 3) The prognosis of CPVS is poor because the secondary pulmonary hypertension (PH) is progressive. Since the effectiveness of treatments for CPVS, such as surgical repair with a sutureless technique, balloon angioplasty, stent implantation, and chemotherapy,4, 5) are limited, the pulmonary vein restenosis occurs at a high rate. We report here a case of a 3-year-old boy with right lower CPVS and a partial anomalous pulmonary venous connection. The right lower CPVS was surgically repaired using a sutureless technique at the age of 1 year old, however, pulmonary vein stenosis (PVS) recurred, resulting in recurrent hemorrhages. We performed a partial resection of the lower lobe of the right lung to treat hemoptysis. Partial right lower lobectomy was effective for the recurrent hemorrhage due to pulmonary vein restenosis after CPVS repair. The patient was a boy aged 3 years and 5 months. He was born via a cesarean section at 39 weeks’ gestation, with a birth weight of 2,354 g. He had no family history of congenital heart disease. At 2 months of age, he was diagnosed congestive heart failure with atrial septal defect when he suffered from viral infection. At 6 months, he was referred to our institution for further examination and treatment. Three-dimensional computed tomography (CT) revealed the right superior partial anomalous pulmonary venous connection to the superior vena cava and the stenosis of the right inferior pulmonary vein at the orifice (Fig. 1a–c). No stenosis was observed in the left superior pulmonary vein. At 9 months, cardiac catheterization revealed that he had an elevated mean pulmonary arterial pressure (28 mmHg) with a normal pulmonary artery wedge pressure bilaterally (10 mmHg). His left inferior pulmonary vein drained into the left atrium via the left superior pulmonary vein. The pulmonary to systemic flow ratio (Qp/Qs) was high, at 3.7, indicating that PH was due to increased pulmonary blood flow by atrial septal defect (Table 1). Fig. 1 a) CT at 8 months showing a partial anomalous pulmonary venous connection of the right upper pulmonary vein. b, c) CT at 8 months showing stenosis of the ostium of the right inferior pulmonary vein into the left atrium. d) Preoperative chest radiography. Diffuse congestion can be seen in both lungs, with severe congestion particularly evident in the right lung. e) Postoperative chest radiography showing the accumulation of pleural fluid in the right lung. f) Chest radiography 2 years after surgery. Most of the pleural fluid had been absorbed, and the upper and middle lobes of the lung had increased in size to compensate for the resected portion. The use of a pulmonary vasodilator alleviated the pulmonary vascular resistance and pulmonary hypertension. At 1 year of age, he underwent surgical repair with sutureless technique for the right lower PVS and rerouting of the right upper pulmonary vein to the left atrium using the modified Warden. The sinus venosus type arterial septal defect was 13 mm of diameter. The pulmonary vein branches were trimmed and cut back enough to ensure sufficient large openings. The transected left atrium wall and surrounding pericardium were then circumferentially sutured to the pulmonary veins. After the release of PVS, the pulmonary-to-systemic blood pressure ratio (Pp/Ps) decreased from 0.75 to 0.35 with intraoperative measurement. In addition, a biopsy of the right middle lung was performed. This revealed the thickening of the tunica media without hypoplasia of the pulmonary arteries or pulmonary vascular obstruction. The smooth muscle cells in the pulmonary veins had proliferated and formed the tunica media. Echocardiography showed progressive right PV restenosis from 3 months after surgery, therefore, we performed cardiac catheterization when he was 1 year and 6 months old. This examination revealed severe pulmonary arterial hypertension and right PV stenosis. Since there is no obstruction of left pulmonary vein, we calculated right and left pulmonary vascular resistances separately using the results of lung perfusion scintigraphy (right-to-left ratio was 15 : 85) to obtain each pulmonary blood flow. Both pulmonary vascular resistances were elevated with a large deference (right, 52.6 units m2; left, 9.91 units m2). We judged that pulmonary arterial hypertension could be treated and initiated bosentan, sildenafil, and home oxygen therapy after the catheterization. Thereafter, pressure gradient of tricuspid regurgitation by echocardiography decreased from 85 mmHg to 40 mmHg. Despite the improvement of PH, he suffered from focal right lower lobe pneumonia complicated with pulmonary hemorrhage repeatedly from the age of 2 years and 4 months. At 3 years and 5 months of age, we performed further examinations including cardiac catheterization. On chest X-ray, there was diffuse pulmonary congestion in both lung fields without pleural effusion (Fig. 1d). The ejection fraction was 63%, and the ratio of right-to-left ventricular systolic blood pressure was estimated to be 0.52 by echocardiography. The blood flow velocity was 2.1 m/s in the right pulmonary veins indicating the remaining of right PVS. On cardiac catheterization showed the descending aortic pressure and the pulmonary arterial pressure was 70/44 (55) mmHg and 42/17 (29) mmHg, respectively. The pulmonary vascular resistances calculated using pulmonary blood flow ratio (right : left=3 : 97) by lung perfusion scintigraphy were 38.9 units m2 on the right and 3.60 units m2 on the left (Table 1), indicating that the pulmonary vascular resistance was improved by medical intervention. Right pulmonary arteriography revealed diminished pulmonary vascular bed, right lower PV obstruction (Movie). These results showed the patient’s ventilation and blood flow were primarily dependent on the left lung. Bronchoscopy did not reveal the bleeding point in the right main bronchus. The recurrent infection and hemoptysis in the lower lobe of the right lung were considered life-threatening. Therefore, we decided to perform a partial resection of the lower lobe of the right lung. The lobectomy proceeded without complication, and he was discharged 1 month after surgery. On X-ray, unlike many adult cases right upper and middle lobes increased in size to compensate for the resected portion of the right lower lobe without a mediastinal shift (Fig. 1e, f). The administration of bosentan, sildenafil were continued to treat the pulmonary arterial hypertension. Although he was subsequently re-admitted twice for pneumonia, there was no evidence of hemoptysis for 5 years following the lobectomy. Oxygen saturation is 96% on room air, and he continues oxygen therapy only during night and goes to school without exercise restrictions. This case yielded two main findings. First, a partial lobectomy can be effective for treating hemoptysis and pulmonary hemorrhage due to pulmonary vein restenosis after a surgical repair of CPVS. Second, a partial lobectomy in early childhood can preserve the respiratory reserve through compensatory development of the remaining lobes without causing a mediastinal shift. CPVS shows various forms morphologically from a focal stenosis of the pulmonary vein orifice to the wide range of pulmonary vein hypoplasia. The symptoms of CPVS and their severity depend on the degree of stenosis and its extent3, with common symptoms in early infancy including poor weight gain, tachypnea, and repeated bouts of respiratory infections. CPVS can also cause hemoptysis in children,3) as was observed in the present case. Most cases of CPVS are treated by surgical repair with sutureless technique or via cardiac catheterization, such as stent implantation or balloon angioplasty.6) However, in cases of diffuse and progressive pulmonary vein stenosis, the effect of these treatments is limited. Therefore, lung transplantation might be a useful treatment option for CPVS. In a study by Holt et al.,2) 7 of 31 patients with bilateral CPVS underwent lung transplantation and 4 of those patients were received as their initial treatment. Three of the 7 patients who underwent lung transplantation survived 2–11 years after surgery. Since lung transplantation is not a common treatment option, partial lobectomy can provide an effective treatment option for focal PVS especially in patients with severe congestion and marked PH or hemoptysis. When a partial lobectomy, common treatment for young patients with bronchiectasis or pulmonary sequestration, is performed in early childhood, the respiratory reserve can be maintained because of the compensatory development of the remaining lung lobes without causing a mediastinal shift. Regarding CPVS patients, one study reported the effectiveness of pneumonectomy for treating patients with unilateral PVS,7) however there have been few reports of a partial lobectomy being performed for the same purpose. Pneumonectomy markedly reduces the respiratory reserve function and may cause thoracic cavity collapse, resulting in the mediastinum shift potentially causing the stenosis of the main bronchus of the remaining lung through vertebral compression. These complications might become serious problems, especially after the removal of the total right lung. In the present case, only the right lower lobe exhibited the destruction of the alveolar structures and had no ventilatory capability because of severe PVS, lung congestion, and repeated bouts of inflammation. In addition, there was no pulmonary congestion in the right upper and middle lobes, and the pulmonary vein drainage was maintained. For these reasons, we consider the right lower lobe lobectomy is a better treatment option rather than the right total pneumonectomy. The lobectomy allowed compensatory development of the remaining lobes after surgery without causing a mediastinal shift, preserving the patient’s respiratory reserve. 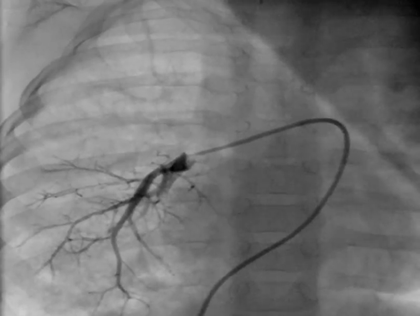 In a young patient with CPVS, a partial lobectomy was effective for treating a pulmonary hemorrhage due to restenosis of the pulmonary vein after surgical repair using a sutureless technique. This strategy improved the patient’s quality of life. Supplementary movies are provided online for this article.